These restaurants, cafes, and bars might be tricky to find, but once you find these gems, the search will have been well worth it. These establishments are some of Vancouver’s best-kept secrets (some more secret than others), but now you too can enjoy these treasures. From underground cocktail lounges emulating the roaring twenties to cafes in the middle of much-loved neighbourhoods – go out and find them, if you can! Hundy operates in the same building as Their There in Kitsilano at 2042 West 4th Avenue, and will only open after the beloved cafe closes. The new joint is a “thoughtful, minimalist approach to burgers and fries.” This new counter service spot opens from 5 pm till late on Thursdays, Friday, and Saturdays. You’ll find this gem at Northern Building Supply Ltd, where the kitchen will be whipping up mom and pop diner classics (which they’ve been doing since the 1960s). Located at 789 Gore Avenue, this new-ish destination for mid-morning meals, Honeybee Bruncheonette, transforms into a spot for drinks and bites in the neon light, aka Soap, by night. Fans of Bodega On Main also enjoy the spot’s underground bar, Gran Reserva Downstairs. A hip place to be and a popular spot to settle in if you happen to be on Vancouver’s Main Street. Guilt & Co is a destination to head for an awesome atmosphere daily from 7 pm till late. 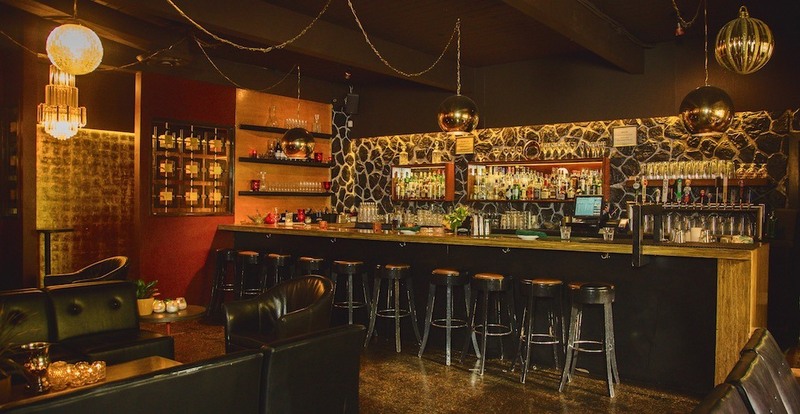 Live music, whiskey, and brews are endless at this low-key Gastown haunt. Look for the red light, that’s how you’ll find this secret spot. Located on the corner of Main Street and 3rd Ave, head here so a modern speakeasy atmosphere, delicious drinks, and delectable bites. Head through an unmarked door and step into this “drinking den.” The basement bar is notorious for good times and good drinks – after all, it’s only open Thursday to Saturday. This spot also boasts Hon’s dumplings, table service, live music, and DJs. Gastown restaurant Di Beppe has a small coffee shop called Caffe Di Beppe tucked right beside it. The cafe has a different address (2 West Cordova Street) and it’s all about the espresso, baked goods, and hot sandwiches. Hidden inside the luxury department store Nordstrom is Habitant, a swanky bar on the second floor. If you head up one more floor, you’ll find the seasonally-inspired Bistro Verde. On the fourth floor of the Rosewood Hotel Georgia is the sensational outdoor cocktail lounge, Reflections in the winter, and The Garden Terrace in the summer. The hotel’s other hidden spot, Prohibition, is open three days a week, Thursday through Saturday. To enter, look for the green light on the side of the Rosewood Hotel Georgia along Howe Street for the dark stained wood door. 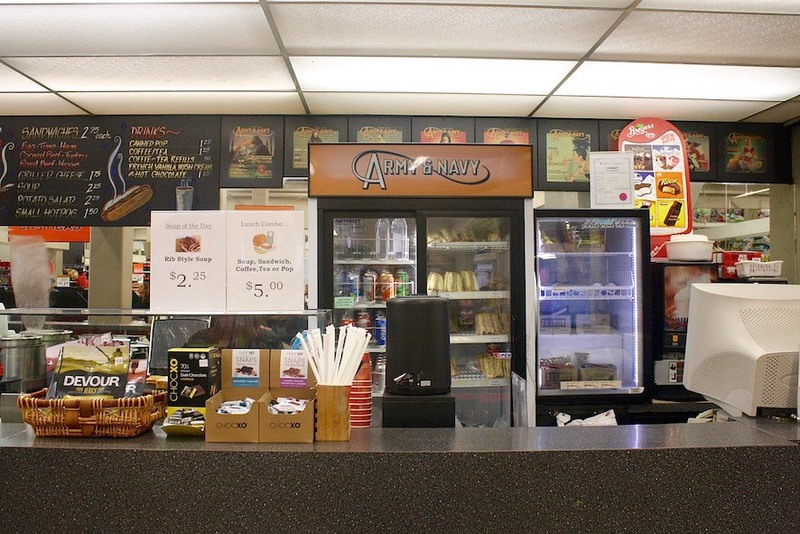 Inside Army and Navy, there’s a lunch counter serving up hot and prepared food for a bargain price out of the discount department store. This Vancouver heritage home turned cafe is nestled in a residential area at the corner of Ash Street and West 7th Avenue, one block west of Cambie street. The charming two-storey cafe makes a fabulous cup of matcha to fuel you through the day. Gringo is an upbeat taco bar serving up affordable tacos in a space filled with bright pink flamingos and neon signs. This Mexican cantina is located along Blood Alley across from Tacofino’s patio in Gastown, between Carrall and Abbott street. In the Mount Pleasant neighbourhood sits the beloved Le Marche St George. Part cafe, part grocery store, Le Marche offers a momentary escape from the chaotic big city with its hot lattes and expertly crafted crepes. Chancho Tortilleria is located at 1206 Seymour Street and has seating for around 15 people, but patrons are also encouraged to grab and go at this fast-casual Mexican eatery. The menu is completely focused on artisanal tortillas made fresh daily in the Lenin tortilla machine, which was made in Mexico and imported from Texas. Salt Tasting Room is located in Gastown’s Blood Alley Square and has mastered the art of charcuterie boards and wine pairings. Create your own unique tasting experience by picking three artisanal cheese and cured meats, three condiments, and a flight of three wines. Through a glass door and up a flight of stairs is the award-winning cocktail lounge, The Diamond. It’s all about the cocktails at this joint and it is hard to pick just one from their extensive three-page menu. This spot also has a back room, which serves simple highballs, beer, and plays VHS tapes on an old-school TV. Tucked into bustling Granville Street, The Bottleneck is super easy to cruise past if you’re on a mission. Great for cheap drinks and filling food like pizza and charcuterie, this spot serves as a central place to pre-game before a concert or night on the town. Vancouver’s first natural wine bar isn’t out in the open, it’s tucked right next to its sister restaurant, Farmer’s Apprentice. It’s got 30 seats and awesome cocktails and you’ve got to check it out if you haven’t already. This hidden gem is located inside The American and they make one of the best burgers in town (in our opinion). Vegetarian, vegan, or beef – this spot’s got you covered. Behind the green door in Chinatown and up the stairs you’ll find The Emerald’s talented bar staff creating drool-worthy libations and delicious bites in this former dim sum restaurant. With files from Gurleen Boparai.